Hundreds of thousands of pregnant women in the UK can now be prescribed a pill licensed for morning sickness for the first time in decades. Xonvea is the first pill of its kind to specifically tackle nausea and vomiting during pregnancy (NVP) since Debendox was withdrawn in the 1980s. The drug has been used for years in the US and Canada – but wasn’t licensed for pregnant women in the UK to take until this summer. Xonvea has only been launched by a drug firm in the UK today. Pregnant women with NVP are recommended to take between two and four pills a day. For years expectant mothers battling morning sickness in the UK have relied on general anti-sickness drugs to combat their symptoms. In the wake of the thalidomide scandal of the 1950s, doctors have been reluctant to prescribe them because they weren’t tested on pregnant women. Several trials on pregnant women have shown Xonvea is around 23 per cent better than placebos at stopping symptoms of morning sickness. It could be used by women who have already tried changing their diet and lifestyle to avoid sickness but still need medical help. The British Pregnant Advisory Service said it hoped Xonvea would help reduce the number of women whose morning sickness is so bad they have an abortion. Up to 80 per cent of all pregnant women suffer from NVP, which amounts to around 690,000 women in England and Wales. And sickness is the most common cause of hospitalisation for expectant mothers – 33,071 women were admitted in 2016-17. 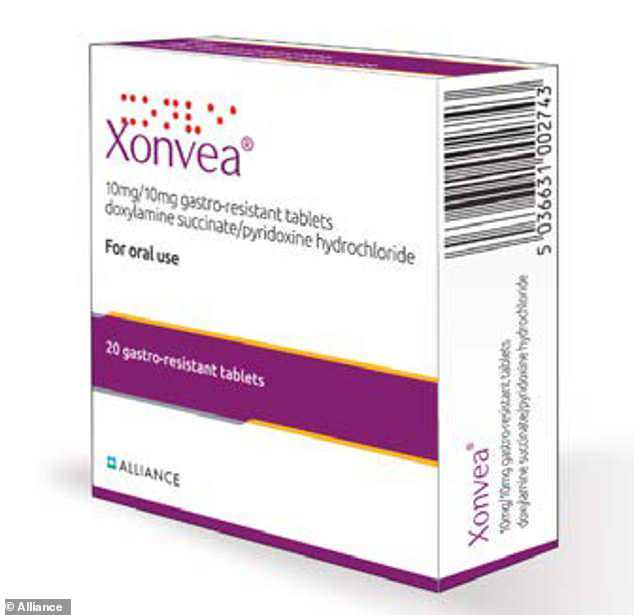 Millions of women elsewhere in the world have used Xonvea and research has shown the drug is not toxic for foetuses, manufacturer Alliance Pharma said. It was approved in Canada in 1979 and the US in 2013, but the UK is years behind because drug companies have been reluctant to get the drug licensed. This is in part because of fallout from the thalidomide scandal, experts say, which has put doctors and drug companies off pushing the drugs through. WHAT WAS THE LASTING LEGACY OF THALIDOMIDE? Thalidomide was responsible for one of the biggest drug scandals in history when it was prescribed to pregnant women as a treatment for morning sickness in the late 1950s. It caused defects in the growing foetus and around 10,000 babies were born around the world with stunted arms. In some cases the child victims had no limbs at all. When it was made available in Britain in 1958 the drug had not been subjected to the rigorous medical standards of testing which are in place today. Thalidomide was withdrawn from the world market in 1961 after its devastating side effects became apparent. In the UK, of the approximately 2,000 babies born with defects, 466 survived. Thalidomide was used to treat morning sickness in the 1950s but it caused miscarriages and left thousands of children with severely deformed or missing limbs. Caitlin Dean, chair of the Pregnancy Sickness Support charity, said: ‘Xonvea hasn’t been licensed in the UK before now because the process is complex and there hasn’t been a drug company willing to try it. ‘Pregnancy sickness treatment has been affected by stigma and the hangover from the thalidomide scandal. Ms Dean added: ‘Hopefully, with the licensing of Xonvea, doctors will have the confidence to prescribe and women will have the confidence to take medication for their symptoms rather than suffer in silence. ‘We all know that sickness is a normal, expected and even, at times, a welcome part of pregnancy. ‘But for some women symptoms are severe enough to substantially impact their day to day lives and can be utterly miserable to endure. Nausea and vomiting in pregnancy (NVP), also known as morning sickness, is a common symptom in pregnant women. It most commonly happens in the first three months of pregnancy, and makes women nauseous and more likely to vomit. Although called morning sickness it can affect expectant mothers at any time of the day and throughout their pregnancy. It is thought to be caused by hormonal changes and the risk in higher in mothers expecting twins or triplets, if it runs in the family, if the mother is obese, or if they are stressed. Morning sickness does not put the baby at any extra risk and it usually clears up by weeks 16 to 20 of pregnancy. Recommended treatments include rest, eating little and often with high carbohydrates and low fat, and drinking plenty of water. Debendox, a combination of antihistamine and a form of vitamin B6, was voluntarily withdrawn from sale in 1983 after a legal challenge that claimed it was associated with birth defects. A similar drug has long been used in Canada with no ill-effects. Clare Murphy, director of external affairs at the British Pregnancy Advisory Service said: ‘We welcome the news that finally, a license has been granted for a medication to treat nausea and vomiting in pregnancy. ‘We know many women are simply told to put up with debilitating symptoms on the basis that no medication is safe in pregnancy, when in fact the risks of not treating may be significantly higher. But the drug is not a miracle cure for all women, Ms Murphy added. She said: ‘This is no silver bullet. ‘It is important to note if this medication does not work or symptoms deteriorate, a number of other safe medications are available even if they have not been specifically licensed for use in pregnant women. ‘This medication is a first level of treatment for pregnancy sickness and will generally not be sufficient to treat the most severe form of the condition, Hyperemesis Gravidarum, the condition suffered by the Duchess of Cambridge. Xonvea is made of doxylamine and pyridoxine, estimated to have been used by 33 million women worldwide during the past 40 years. Professor Catherine Nelson-Piercy, a consultant obstetric physician at Guy’s and St Thomas’ Hospital in London, said: ‘This delayed release formulation of doxylamine and pyridoxine has been used in millions of pregnant women worldwide.